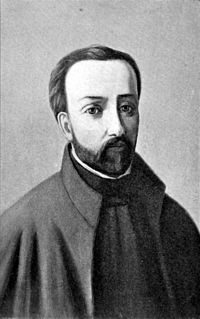 LALEMANT, GABRIEL, priest, Jesuit, missionary and martyr; canonized by Pope Pius XI, 29 June 1930; b. 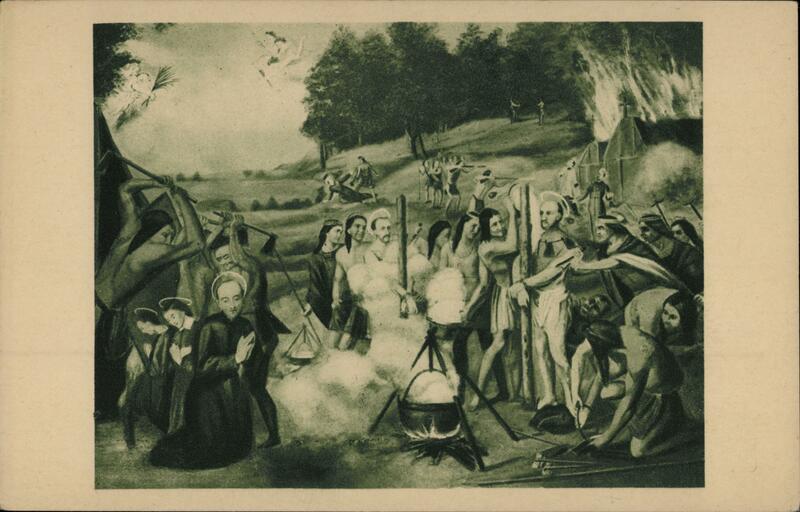 3 Oct. 1610 in Paris; killed by the Iroquois 17 March 1649. Gabriel Lalemant was the son of a lawyer in the judicial court (Parlement) of Paris. The 1649 Relation implies that he belonged to the nobility: “Although, in leaving the world, he had left the share which his birth gave him in honorable offices. . . .” He was 20 when he entered the noviciate in Paris on 24 March 1630. Two years later he was granted permission by his superiors to add to the three usual religious vows that of devoting himself to foreign missions; 14 years were to elapse between the taking of this vow and Gabriel’s arrival in Canada. In the interval he was a teacher at the Collège in Moulins (1632-35), studied theology at Bourges (1635–39), was minister to the boarding-school pupils at the Collège in La Flèche (1639–41), was philosophy teacher at the Collège in Moulins (1641–44), and prefect of the Collège in Bourges (1644–46). The Journal des Jésuites records his arrival under the date 20 Sept. 1646. We know little about his stay in Quebec (1646–48). Early in September 1648 he arrived at Sainte-Marie-des-Hurons and he was diligent in the study of the language. His success was so prompt that in February 1649 he replaced at the Saint-Louis mission Father Noël Chabanel, who had been called away. On 16 March 1649, a war-party of 1,000 Iroquois overran the little town of Saint-Ignace and captured it before sunrise, almost without striking a blow. From there they went on to the Saint-Louis mission, about a league away. Here the Hurons defended themselves stoutly, and drove back two separate attacks. But by weight of numbers the Iroquois were victorious here as well. 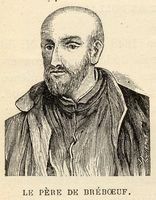 Jean de Brébeuf and Gabriel Lalemant were at that time at the Saint-Louis mission. They were urged to flee; they refused, “and, during the heat of the combat, their hearts were only fire for the salvation of souls.” As soon as they were captured they were stripped of their clothes, their nails were torn out, and they were taken to the little town of Saint-Ignace (half-way between Coldwater and Vasey, in the county of Simcoe, Ontario). His body, buried with Brébeuf’s beneath the chapel of the Sainte-Marie residence, was taken up and moved to Quebec in the spring of 1650. Almost all that we know about Gabriel Lalemant we owe to the Relation of 1649 (JR (Thwaites), XXXIV, 24–36). JJ (Laverdière et Casgrain), passim. 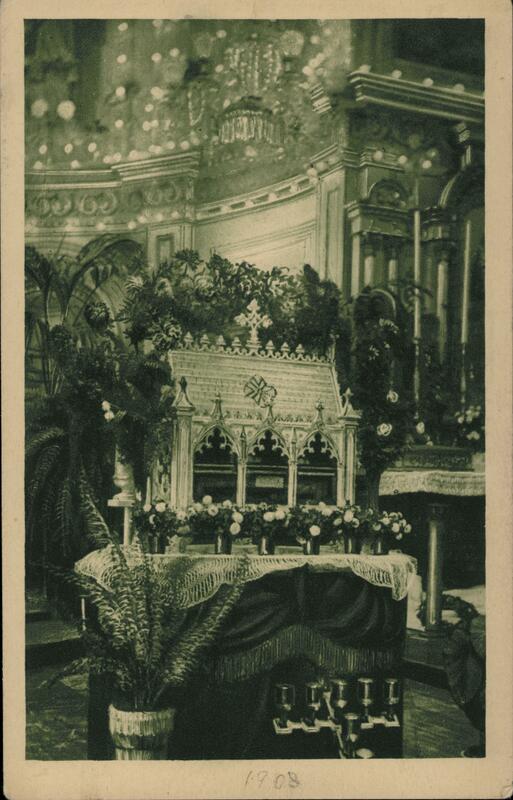 See also ACSM, “Mémoires touchant la mort et les vertus des pères Isaac Jogues . . .” (Ragueneau), repr. APQ Rapport, 1924–25, 3–93, passim. Positio causae. Christophe Regnaut, “Récit veritable du martyre et de la bien heureuse mort, du Père Jean de Breboeuf et du Père Gabriel l’Alemant en la Nouvelle France, dans le pays des hurons par les Iroquois, ennemis de la foy,” 1678, in PAC Report, 1884, Note E. 1xiii. Léon Pouliot, “Notice sur Gabriel Lalemant,” dans Les saints martyrs canadiens (Montréal, 1949), 25–28; 115–21. Rochemonteix, Les Jésuites et la Nouvelle-France au XVIIe siècle, II. Léon Pouliot, “LALEMANT, GABRIEL,” in Dictionary of Canadian Biography, vol. 1, University of Toronto/Université Laval, 2003–, accessed April 22, 2019, http://www.biographi.ca/en/bio/lalemant_gabriel_1E.html.